I felt pretty crazy at the end of my pregnancy with Cooper; I was very emotional. My due date arrived (on a Tuesday), which I had naively hoped I wouldn’t make it to. That day Russell woke up with major back pain and was practically immobile; the next day was even worse. I was so emotional and spent almost the whole day crying, being 40 weeks pregnant and watching Russell, my main support system for the birth, incapable of standing was a little more than I could handle. With the help of the chiropractor and acupuncture Russell was back on his feet and mostly functional by Friday. With Russell down though we decided that my Mom should just plan to arrive Friday night regardless of whether or not baby had arrived. Thursday night I had contractions for a few hours that slowly died out and then stopped completely by about 5:00am. I was devastated, but it did give Russell more time to get better. I had a few random contractions throughout the day on Friday and that night we picked up my Mom from the train station at 7:00pm. We spent the evening opening gifts from my mom and ordered pizza for dinner. I had talked with my Midwife on the phone that evening and decided that I just needed to see if I could get labour going again, so I decided to drink the castor oil verbena cocktail. I took the drink at about 7:45pm and then again at about 10:30pm, then I went to bed. I was able to sleep for a while. At midnight I started getting contractions. They continued to come consistently, but not very intense. I was able to lie in bed and rest through contractions until about 3:00 am. I finally got out of bed and walked around a bit, contractions had started to get more intense, but not enough for me to be convinced yet that I was for sure going to have this baby. I called the midwife to tell her what was going on; I just really didn’t want contractions to stop. The contractions were definitely different than the night before and different than I remember from my other two births. They were just in the lower half of my belly, a little in my upper thighs, and in my lower back. We decided I should get in the tub and see if contractions spend up or slowed down. Thank-fully the tub test intensified labour, and contractions started coming closer together and more intense. They started coming in sets of three; about 1 minute apart and then I would get a 5-minute break. We called the midwife back at about 4:00am to let her know. She decided it was time to come and made it to our place by about 5:00am. My Mom arrived right after the midwife; we decided she would come and take pictures and help with the kids, she was so helpful, and I was so glad in the end that she was there. Russell set up the birth pool and filled it. I had gotten out of the tub at this point and was just doing my thing working through contractions, swaying and lowly moaning and breathing through each surge. Labour continued to progress and intensify at a nice steady pace. I spent most of my time leaning forward, working through each surge. I had some diarrhea for a while so I stayed close to the bathroom. Russell supported me when needed and rubbed my lower back. My midwife, Stephanie, was amazing, giving me encouragement and helping me stay focused and hydrated throughout the whole process. Porter woke up at about 6:45 am. He was a little surprised by the whole scene, but was sweet and kind. He gave me hugs and encouragement and was really excited about the idea that the baby was coming. Contractions we getting more intense and I decided to get into the pool. The warmth and buoyancy were such a relief. Edith woke up around 7:30, and joined us in the living room. The kids watched and talked while I laboured. Then my mom and Russell got them ready to leave, my mom even braided Edith’s hair. We called our friend to come pick them up; she arrived at 8:30am. It was nice to have them around for a while and be a part of the whole birth process, but they had started to get restless and I was ready for them to leave by then because things had got up a notch again. I got out of the pool to go to the bathroom once, and Stephanie encouraged me to stay there for 3 contractions. This was hard work. That position was very difficult and intense for me to be in. Getting back in the pool was a relief. Shortly after the kids left I started to go through transition (probably not a coincidence). I was on my knees in the pool, sitting back on my heals, one hand holding onto Russell and the other I kept down, holding my perineum most of the time. Keeping one hand on my perineum really helped me stay connected and grounded to what was happening. Each surge took all my concentration and energy now. I talked to myself out loud between surges, reciting my birth affirmations that I had taped up on the walls around the house. Through each surge I moaned loud and low. I had more back labour this time and so with each surge Stephanie did counter pressure on my hips, which really helped. I could feel myself opening up. It was intense and I could feel myself panicking a few times, but was able to bring myself back down and stay grounded with my breath, focusing on Russell and keeping my hand on myself. It was pretty incredible as I began to open, I could feel my waters bulging; they hadn’t broken yet. Because the waters were still intact, there was a lot of pressure. 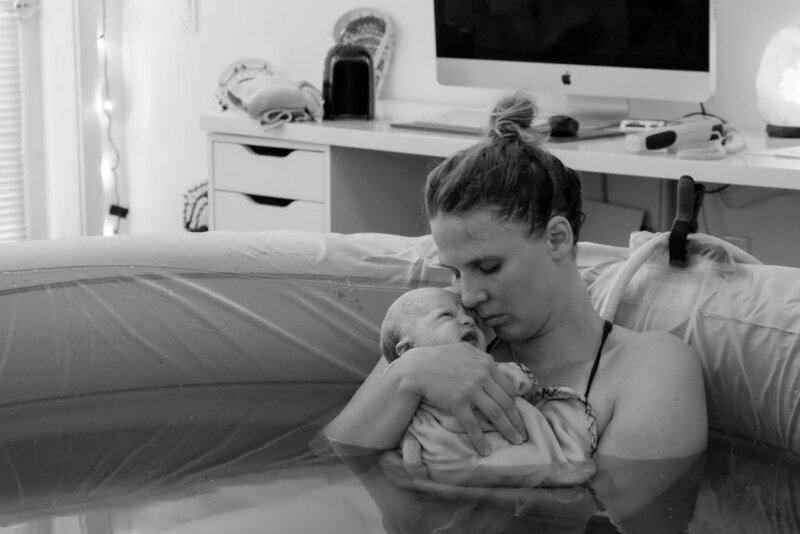 I asked Stephanie about breaking my waters, but the second midwife had not arrived yet and she didn’t want to risk speeding things up and the second midwife not being there. Within the next 5 minutes though she arrived and literally as she walked through the door I felt my waters break in my hand. Baby was really coming down now. I opened up more and more with each surge, I am not sure how many contractions it took, I just know it was more than it took to get Edith out. I felt myself tear a little, and then his head really came down, in 3 more surges he would be out. I sat up a bit and put both hands down to catch his head as he came out. It was the most amazing and intense feeling, as his head came out and I looked down holding his head in the water. Then his body came out. I immediately pulled him up out of the water onto my chest. This moment was all I had been waiting for, for what felt like forever. My baby was finally here in my arms. I was so overcome with emotions. I sat and wept as I held this perfect little body in my arms. After a few minutes I lifted his leg to discover that our baby was a little boy. I was surprised. I had been anticipating a girl, but Russell and the kids had guessed right. He was perfect, covered in lanugo and a serious look on his face. It is hard to sum up all the things I felt in this moment and so I won't, but it is a memory that I will never forget, a sacred moment that has changed me forever. ...and Add a Pinch of 'LIFE'. I have gotten myself into some really great habits recently of incorporating my fermented foods into my daily life, eating them at almost every meal, and let me tell you, I can tell the difference! When I am consistently eating live cultured foods, full of little living microorganisms, I feel alive; I think there is definitely a correlation there. A brilliant friend of mine, Gina Primavera, just wrote a blog post entitled "Your body is NOT a trash can" and her thoughts really got me fired up about food, and life and how its all connected. I really love to think of food as a catalyst for change in a persons life. If someone is feeling, yucky, slow, unfulfilled, drained, I can almost guarantee that is exactly what the food they are eating is doing to their body. Other than breathing and thinking, eating is probably the next thing that all human beings do on a consistent daily basis; it would be very naive to think that this daily practice isn't effecting every aspect of our lives. I know if I stopped breathing I would be in trouble or if I only ever inhaled toxic fumes then I'd have a whole host of other issues. It is the same with food, what you are putting in your mouth is affecting you everyday, in more ways that I think we even understand. Fermented foods = Life. In particular fermented vegetables. Foods like sauerkraut, kefir, miso, lacto-fermented pickles, etc. are brimming with life, Probiotics. Pro, meaning 'for', Bios, meaning 'life', so fermented probiotic foods, literally are FOR LIFE! They support life, not only your life, but all those wonderful little microorganisms that support our daily bodily functions. Add a little life to your daily ritual of eating. 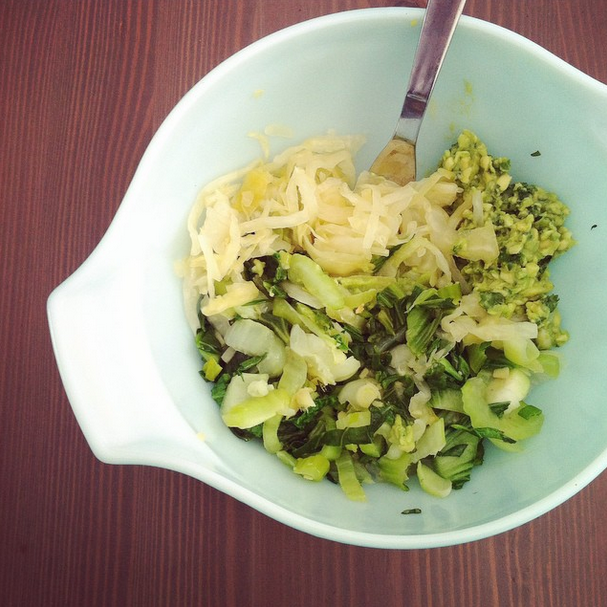 Want to learn how to make these wonderful fermented foods? 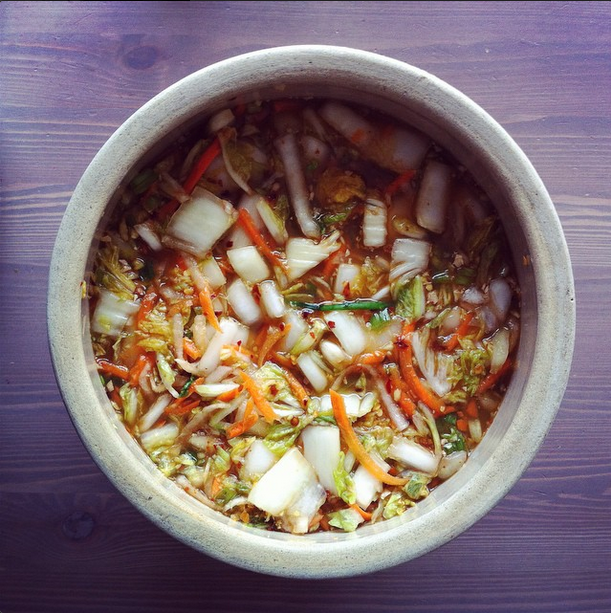 Attend a "Fermentation for Gut Health" Workshop, check out all the details here. The next workshop will be held in Saskatoon, Sk. on Friday, Feb. 27th, 2015. This post isn't going to be about why you should eat fermented foods, or why you should learn to make them yourself, or why they can help you with your health, or why they are SO awesome. This is about why I do what I am doing. THE BIG WHY. The thing that drives me, motivates me, makes me tick. To simplify it in one word, CHANGE. My whole health journey has really been one of transformation; more about learning who I am, than achieving an ideal state of health or body composition. The things that have brought me to where I am today have helped me uncover facets of myself that I didn't believe were there before. I used to maintain the attitude that I was dealt a certain hand in life and that not much could change that. I used to struggle with stomach pains, headaches & migraines, asthma, depression and acne to name a short list. I had a glimpse one day that this wasn't the way it had to be, that I could change, and I made the leap. I changed the way I eat. The incredible thing that I didn't expect was that it changed me in other ways than just my pant size. Little chronic health things that I dealt with began to fade away, in part I only became really aware of them when they were gone. I started to be much more aware of myself. This awareness felt like an awakening, like my eyes had been opened just a little wider and I began to see myself in a different way, as well as the world around me. So, why do I ferment? And why do I want to teach people about it? The process of fermentation has taught me a lot about life, myself, and the world. As if, what is contained in a jar of food sitting on my counter is a microcosm of the greater world around me. Most things in life that are truly worth it require time. Most change doesn't happen overnight. We must invest our time and energy into things that we want the most; relationships, family, health, etc. Sometimes the hardest part of fermentation is the waiting. And accepting all the smells and mishaps that can come with it. It requires specific conditions for positive transformation. Not everyone is ready for change, right now. But, at some point when the right conditions exist we all have the potential to change into something immensely more wonderful than the original product. I mean lets be real, its a little scary at first eating food that has sat on your counter for several weeks. It takes a little faith, as do most things in life worth doing. I could probably keep going with this, but I think I will stop here. I'd love to hear your experience about how food has changed you. Leave a comment below! Needless to say, I am excited to teach people this amazing process of Fermentation. If I have sparked your interest, I am so excited to announce my first two workshops in Saskatoon. Friday, February 27th @ 6:00pm, and Saturday, March 14th @ 10:00 am. I am also looking at doing a Workshop in Lethbridge, Alberta on February, 14th, if this interests you please leave a comment below. Check out the Events Calendar and Workshop pages for more details. I am so excited that this project is finally up and running. Bear with me as I continue to make some small improvements on this website and on the overall function of my work. I am so excited to start sharing with you the things that really get me fired up about life and bring me JOY! Also, it would mean so much to me if you would take the time to fill in the form on the right, get some free info and you will also be added to my mailing list so you can stay in-the-know about all the new and exciting things that will be happening here at estherbeazer.com! Subscribe to receive emails updates for upcoming events.